Gemma's Pilates and Movement Training was featured in the Main Line Chamber of Commerce's e-newsletter the Main Line Business Daily and also in the Ardmore-Merion-Wynnewood Patch online newsletter as a "top new business" on the Main Line. 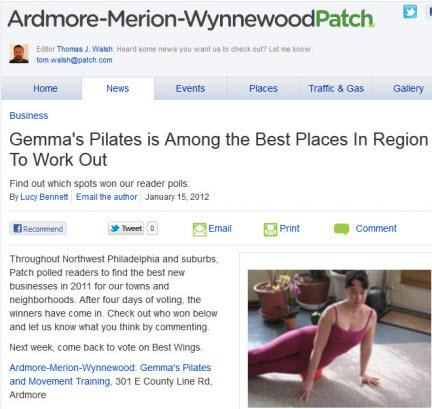 Ardmore-Merion-Wynnewood Patch recently took a reader poll on the best spots to work out, and Gemma's Pilates and Movement Training won! The results were listed in both publications.